Healing Waters Lodge and Lewis & Clark Expeditions operate under the ownership of fly fishing outfitter Mike Geary and his wife Laura. In 2013, Mike and Laura bought Healing Waters Lodge and moved from Helena to Twin Bridges. 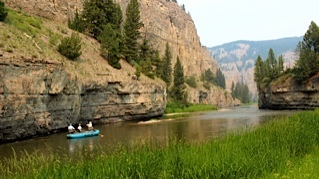 Smith River float trips, guided fly fishing and lodging at Healing Waters Lodge, fish like a guide schools, and day trips are what they do best. Please call Mike today at 406-459-2030 for more information.